NATO and the United Nations have signed a new cooperation accord on prerogatives for UN member states – but have angered Russia by not telling them about it in advance. Russian Foreign Minister Sergei Lavrov said that Moscow supports the cooperation of regional organisations with the UN, but stressed the importance of making these sorts of developments more transparent. He said that the agreement had been signed secretly during the ministerial week of the UN General Assembly. The Russian minister said that he discussed the problem with UN Secretary General Ban Ki-moon. “I did not hear any reasonable explanations. 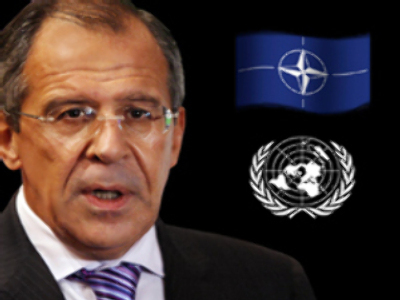 It surprised me,” said Lavrov. The text of the agreement contains a provision on prerogatives of member states. That includes cooperation in maintaining international security on the basis of the UN Charter and certain international directives. According to the Russian minister, decisions of that level should be made by member states, not organizations' secretariats. “We asked the leadership of the two secretariats what it might mean. We're awaiting answers,” said Lavrov. Russia’s representative in NATO, Dmitry Rogozin, said that in the document there is not a single word on the UN's leading role in ensuring stability in the world. “NATO should fully acknowledge the UN's universal role and not try to substitute UN functions,” he said.